The second season of Senran Kagura is coming this October! Tetsuya Yanagisawa (High School DxD) is directing the anime at studio TNK; Yukinori Kitamijais handling the series composition. 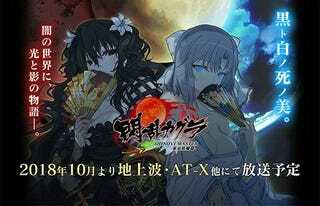 Judging for what I saw, the anime is (obviously) set in the Shinovi timeline, also it´s seems that it will feature the story set in the Gacha game “New Link” due to the uniform that Yumi uses and the appeareance of the long haired white hair twins, who according to Takaki (Senran Kagura´s creator) himself, they were made in order to be evil, not like the past ninja grousp where yeah, they ahd their own agendas and goals which will be confronted against the other ninjas; but in the end of the day they were good girls...Not with this ones whoa re purely evil. Having said that... I´m Hyped and I´m soo covering this!